Join me in my four month journey as I travel across the globe to the overpopulated, communist, and air-polluted country of China. Whether it's haggling with street vendors, eating whatever comes my way, or putting my ping pong skills to the test, you can bet I won't leave any bit of my antics back home in the States. I'm ready to give China everything I've got, and in return I'm hoping it will show me the time of my life. I felt a little stupid for choosing Seoul as my fall break destination, given that I came to Asia primarily to study Chinese. China has many cities that are ideal for tourism and language practice, but I ultimately gave in to the desire to explore, to look beyond China, to take advantage of being on the other side of the globe for the first time in my life. For me, exploring the city of Seoul not only means seeing my first fully developed Asian country, but also presents a great chance to relieve myself from the mental strain of speaking and studying Chinese everyday. I’ve made a conscious effort to not learn any Korean while I’m here in order to give my brain some rest. I’ve survived so far with knowing just one word, hana, which means “one”. It comes in handy when I only want one of something. For some reason, I don’t mind being the American tourist who can’t understand the people around him. I’ve come to truly appreciate the power of body language, and of Koreans knowing how to speak English. Fresh sashimi from the seafood market. Along the way we’ve also been sampling all the street food and convenience store snacks. So far, more successes than failures. Although I’ve been to Hong Kong and Macau, South Korea, as I mentioned, is the first fully developed Asian country that I’ve ever been to. After being in China for so long, I don’t take for granted the soap in public bathrooms, the available drinking water at restaurants, and the overall cleanliness of the city (fun fact: if you say “Korean” in an Asian accent, it sounds like “clean”). While Shanghai will not likely resemble Seoul in the future (Shanghai has many more skyscrapers), it is cool to get a glimpse of what a developed China might be like in a few years. From observing Korean life, I’ve determined that Asians with blond hair and pet grooming stores are defining characteristics of a developed nation. Even in Korea, there is no escaping the Chinese foreigner picture frenzy. When we were on the DMZ tour, we were attacked by a group of Chinese tourists who all wanted to take individual pictures with us. If you ever start feeling lost in the crowd, you should really head over to Asia. I’m constantly being reminded how cool it is to be white and over 5’7’’. We went on an awesome tour of the Demilitarized Zone (DMZ) that separates North and South Korea. The highlight was walking through one of the infiltration tunnels that North Korea had built in hopes of attacking the South. The average day here has been 60°F with sunny skies, and yet I’d be hard pressed to find a Korean that isn’t wearing pants and at least two layers of clothing. I’ve noticed the same thing back in China. Weather that I find to be very comfortable is often considered quite cold by Chinese standards. We asked our Chinese teacher about this phenomenon in class. Her response: “You all have white skin; we have yellow skin.” I was really shocked by this explanation and find it difficult to accept that tolerance for cold temperatures is a racial characteristic. In any event, I find it hilarious when I’m reminded of this racial difference. One time I walked into work in a short-sleeved Polo shirt on a beautiful, sunny day, and a co-worker asked me “Nǐ bù lěng ma?” [Aren’t you cold?]. In addition, my marketing professor once warned our class, “Be prepared; Shanghai gets very cold in the winter”. Hah, he doesn’t even know what cold is. I’d love to take him to Ithaca. This is what happens when a country becomes too developed. 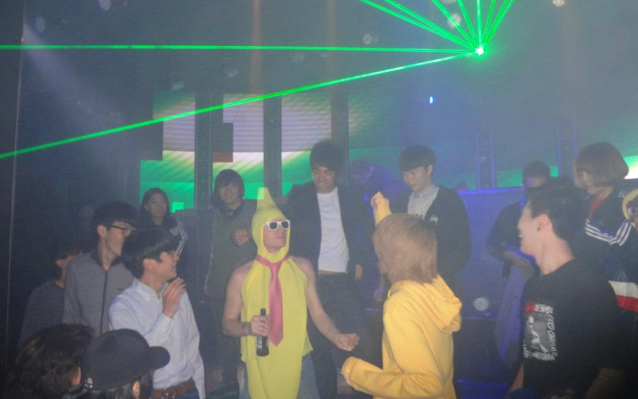 My first night in Seoul was spent at a club in a banana suit. There, I quickly discovered that most Koreans don't celebrate Halloween. That didn't mean that the banana was not a huge hit though. Doing our best to be culturally sensitive. Michael is a junior studying business in the Charles H. Dyson School of Applied Economics and Management at Cornell University. A native Long Islander, Michael has no formal writing experience.